With fourth generation Sinnoh Pokemon now available in Pokemon Go, it's already the perfect time to crack open some Pokemon Eggs. 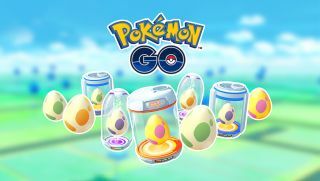 To sweeten the deal for Pokemon Go players, developer Niantic is hosting a Hatchathon event, during which eggs will be more common and yield better rewards when hatched. From now through January 15, Pokemon Eggs will award double Candy and Stardust, making it easier to strengthen and evolve the Pokemon you hatch. Additionally, PokeStops and Pokemon Gyms will award 5 km and 10 km Pokemon Eggs more frequently during the Hatchathon event. These generally give you rarer Pokemon than the more common 2 km variety (7 km eggs are still tied to gifts), so you should have an easier time hatching that one Pokemon you just couldn't seem to get in 2018. You'll still have to do all the walking necessary to hatch the eggs yourself, though. No double-time on that. Of course, that's probably the point; Pokemon Eggs are as good an excuse as any to finally take up running as part of a New Year's fitness resolution. Pokemon Go is still the only game to ever legitimately get me off the couch - for a whole week, at that - so this event might actually give some people the push they need to stick to their 2019 goals. For those looking to expand their fourth-gen roster, here's how to get Sinnoh stones in Pokemon Go. And if finally playing Pokemon Go to see what the fuss is about was one of your New Year's resolutions, here are 18 Pokemon Go tips to help you get started.